Whether we’re talking about powering a flashlight, a CD player, a camera, a wall clock, or a child’s toy, most of us have dozens of devices around the home which require AA batteries. Many devices only take disposable/single-use batteries—others may allow you to choose between single use and rechargeable batteries. But what you may not realize is that there is a wide variety of AA disposable batteries you can choose from. Not sure where to begin shopping for the best AA single use batteries? Below we have compiled a product table comparing top-selling disposable AA batteries. Still not positive what type of single use AA batteries you need? Read on to learn more about your options. What Are Single-Use AA Batteries? 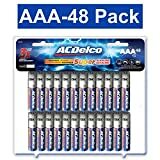 Single-use AA batteries are precisely what they sound like: AA batteries which send a charge to your device until they use up all of their power. At that point, you remove them, throw them out, and replace them with others. The vast majority of appliances are designed to operate using disposable AA batteries. There are two main types of AA disposable batteries: alkaline and lithium. Alkaline batteries are the least expensive and the most commonly used. They run out of power faster than lithium batteries, but they can save you a lot of money. Lithium batteries cost significantly more than alkaline batteries, but offer superior performance and a longer lifespan. They are also necessary for certain devices. Do you need to power a high-drain device or an appliance that is hard to reach or change the battery on? If so, lithium batteries are the better choice. These batteries last the longest. Do you need to power a specialized device like a camera which may require lithium batteries? Certain appliances do not function properly with alkaline batteries. Trying to power a camera with alkaline batteries which lists a requirement for lithium batteries could result in low performance (scan lines in pictures, etc.). Lithium-ion batteries typically make the best choice for a digital camera. Are you trying to power a device which may be damaged by a high voltage? If so, you probably should stick with alkaline batteries. Do you need to replace all the batteries in a device or just a few? If you only need to replace a few of the batteries in a device, you should always pick the same brand and type of disposable AA batteries which are already in the appliance. Mixing together different batteries can have unpredictable results. These are both ratings which measure battery capacity. If you need a long-lasting battery, then look for a higher mAh. The claimed capacity mAh is particularly important for high-drain devices like digital cameras. The fluid which can leak out of poorly designed batteries can be damaging to other materials. On top of that, it poses a human health hazard, and may burn your skin or eyes. For that reason, you want to make sure that you shop for batteries which feature resilient, durable design and offer protection from leaks. You don’t want batteries which are going to leak, lose their charge, or quit on you in extreme temperatures. The best AA disposable batteries will provide you with reliable performance in temperatures ranging from -40 to 140 degrees. Batteries like these may be safely stored and used in your vehicle and other locations which may be subject to wide temperature fluctuations. Lightweight batteries can be very useful, especially if you are powering a device like a camera which you will need to carry around a lot. Heavy batteries can add a lot of unwanted heft. Lithium batteries always have a higher voltage than their alkaline counterparts. Check the manual for the device you need to power to figure out whether a high or low voltage is required. One isn’t “better” than the other. You just need what is right for your device. You now know a lot more about AA disposable batteries. It is easy to walk into the store and pick up the first box of batteries you see, but it really is worth it to take the extra time to do your research and look closely at the specifications for the batteries you are thinking about buying. Choosing the wrong AA single use batteries can cause your devices to under-perform and may even damage them. The right batteries will provide you with powerful, long-lasting performance. Scroll back up to the product comparison chart at the top of this page to find the best single use AA batteries for your appliances! “Batteries” is probably not the first word that comes to mind when you think of the Amazon brand. However, AmazonBasics batteries really do hold their own against the major battery brands. Very reasonably priced. Even though these batteries are good performers, they cost much less than many other name brand batteries. Convenient package. These batteries come in a convenient cardboard package that you can use over and over again. 10 year shelf life. After you receive these batteries, you have a decade to use them. Performance compares to leading battery brands. AmazonBasics batteries are quite powerful and they stack up quite well against the competition. Good for both high and low load devices. These all-purpose batteries are good for just about everything. Advanced manufacturing techniques. Amazon used Japanese technology to create batteries that cost less, yet deliver superior reactivity. The Amazon name brand. Amazon has a great reputation for excellent customer support. Even though AmazonBasics batteries perform quite well, Energizer batteries are just a bit more powerful. Like most other alkaline batteries, they sometimes leak if you leave them in a device for a long period of time. When it comes to durability and power, lithium batteries rule. Though Energizer Ultimate Lithium batteries are pricey, they do last even longer than most lithium batteries on the market. Performs well in high load devices. Lithium batteries can handle the most demanding electronic devices. Stores energy for up to 20 years. If you don’t use your Energizer Ultimate Lithium batteries right away, no problem. You’ve got 2 whole decades to plug them in. Very light weight. These batteries are almost half as heavy as alkaline batteries. Leak resistant. Like Energizer alkaline batteries, these ones never bust open or leak. Great for digital cameras. You’ll get 9 times better performance out of a digital camera with these batteries. The world’s most well-known battery brand. Everyone recognizes the Energizer bunny. That’s because Energizer is the most well-known battery brand in the world. Survives extreme temperatures. Rated at -40°F to 140°F, lithium batteries perform well even in very extreme operating conditions. 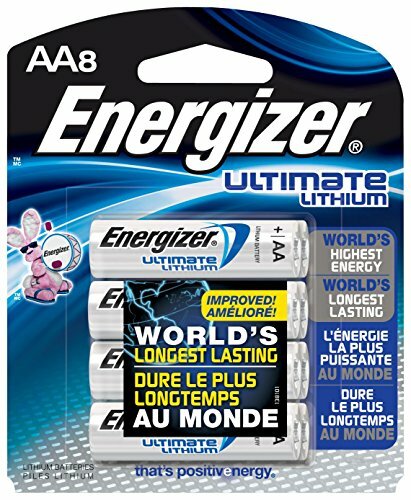 Like most lithium batteries, Energizer Ultimate Lithium batteries are expensive compared to alkaline batteries. Unfortunately, lithium batteries are now prohibited on most US flights. 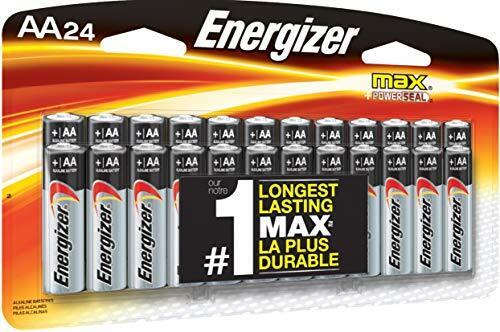 Energizer MAX batteries are some of the highest performing alkaline batteries on the market. They’re also more environmentally friendly than most batteries because they don’t contain any mercury. No leaks. Energizer’s patented design modification enables them to offer a no leaks guarantee. Stores energy for up to 10 years. Once you store these batteries away, you’ve got 10 years to use them before they’ll begin to lose their charge. Environmentally friendly packaging. Energizer uses less plastic and cardboard in their packaging compared to other battery makers. 30% more power than previous version. The latest upgrade gave Energizer batteries a substantial power boost. Performs well in low drain electronics. If your device doesn’t use a lot of electricity, Energizer MAX will keep it running for a long time. World’s most popular battery brand. Energizer is currently the world’s #1 battery maker. No mercury. Energizer batteries are safe to dispose because they don’t contain heavy metals. Even though Energizer is an American company, all its batteries are now made in China. Energizer batteries tend to be more expensive compared to other battery brands. Procell batteries are cheaper than Duracell’s high performance “Coppertop” line of batteries. However, they last almost as long when you use them with devices that don’t consume a lot of power. Safe disposal. Duracell batteries used to contain dangerous amounts of mercury, but now that the company has cleaned up its act its batteries are safe to dispose. Cheaper than Coppertop. Procell batteries are cheaper and just about as strong. 7 year freshness guarantee. These batteries hold a charge for up to 7 years. Performs well when inserted into industrial devices. Practical devices like flashlights, electronic test equipment, door locks and electronic safety equipment work quite well with Duracell Procell batteries. Performs well in extreme temperatures. Though these batteries aren’t quite as resistant to extreme temperatures as lithium batteries, they can still function normally within a -20 to 54 degree Celsius range. Assembled in USA. Unlike Energizer batteries, Duracell batteries are assembled in the US. Good value. If you’re looking for cheap batteries that still perform quite well, get Duracell Procells. Procell batteries don’t last quite as long as Duracell’s premium battery brands. Duracell Coppertop lasts just a bit longer. 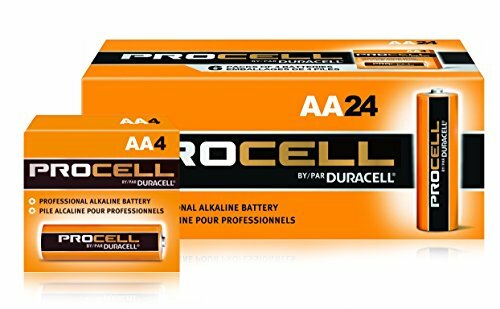 Like other alkaline batteries, Procell batteries sometimes leak if you leave them in a device for a long period of time.